ESPN Deportes is a sports channel aimed to reach the Spanish-speaking community in the United States. It is part of the ESPN Network. This channel is available on most cable and satellite TV carriers in standard and high definition. The most popular streaming and OTT services have also made this channel available to their users. ESPN Deportes covers a vast majority of disciplines, including soccer, tennis and football. 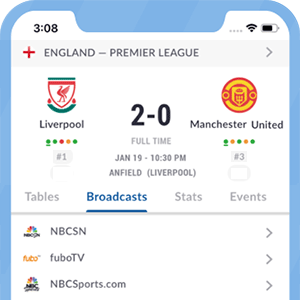 The network's flagship shows such as SportsCenter, Fuera de Juego and Futbol Picante are also available live and in their various re-broadcasts. ESPN Deportes owns broadcasting rights for several football leagues and tournaments around the world, which may include Liga MX, Major League Soccer, Copa Libertadores, Copa Sudamericana and UEFA Champions League games. Added to that, friendly games and World Cup Qualifiers may be included in the channel's programming. ESPN Deportes is available on most payTV carriers in the U.S. Check your local listings for availability. What channel is ESPN Deportes on? *Got itLive Soccer TV does not provide ESPN Deportes USA live streaming. The information provided on this page is simply ESPN Deportes USA soccer TV schedule.